An intriguing Heavyweight battle will take place on Friday night at the Prudential Center in Newark, New Jersey as former two-division world champion Antonio Tarver will face former IBF Cruiserweight world champion Steve Cunningham in a fight scheduled for twelve rounds. In one corner will stand Antonio Tarver the former Light-Heavyweight and Cruiserweight world champion, who is undefeated as a Heavyweight. Tarver has faced many of the best fighters of his era as a Light-Heavyweight including Clinton Woods, Glen Johnson, Bernard Hopkins, and most notably Roy Jones, who he was able to defeat in two of their three fights. Following the successful tenure in the Light-Heavyweight division, which saw Tarver win four separate world championships in the division, Tarver made his Heavyweight debut in October 2010 scoring a ten round unanimous decision over Nagy Aguilera. Although he was successful in his bout with Aguilera, Tarver would opt to move down in weight in July 2011 to challenge International Boxing Organization (IBO) Cruiserweight world champion Danny Green for his crown in Sydney, Australia. Tarver dominated Green before the fight was stopped by Green’s corner at the conclusion of the ninth round. After winning a world title in a second weight class, Tarver would choose to defend that title in June 2012 against undefeated contender Lateef Kayode. The bout, which was ruled a majority draw was subject of controversy when it was revealed in the days following the fight that Tarver had tested positive for a banned substance drostanolone. The result of the fight was changed from a majority draw to a no contest. Tarver was subsequently fined $2, 500 and suspended for one year by the California State Athletic Commission (CSAC). Following his suspension Tarver would return to the Heavyweight division in November 2013 scoring a fourth round knockout of journeyman contender Mike Shepherd. In his last fight in December of last year Tarver scored a seventh round knockout over Johnathon Banks. The forty-six year old former world champion has aspirations of challenging unified IBF/WBA/WBO/IBO Heavyweight world champion Wladimir Klitschko. Before Tarver can put his name in the mix as a potential future Klitschko opponent however, he must be victorious in his upcoming fight. Standing across the ring from Tarver on Friday night will be former IBF Cruiserweight world champion and current top contender Steve Cunningham. Cunningham, a former two-time IBF world champion in the Cruiserweight division has established himself as one of the legitimate contenders in the Heavyweight division scoring victories over veterans Jason Gavern, Manuel Quezada, and previously unbeaten prospect Natu Visinia. Cunningham’s most significant victory as a Heavyweight came in April of last year when he scored a hard fought ten round unanimous decision over previously unbeaten knockout artist Amir Mansour in a fight where Cunningham overcame being knocked down twice in the fifth round to score his own knockdown of Mansour in the final round en route to the decision victory. Despite having a fine career thus far and earning two world titles along the way, Cunningham may be more known for the fights that have gone against him rather than his victories. Some may remember his two battles against former two-division world champion Tomasz Adamek. Two closely fought battles where an argument could be made for either fighter having won both fights. In his last fight in March of this year Cunningham lost a controversial twelve round unanimous decision to undefeated top contender Vyacheslav Glazkov in a fight that was to determine the number one ranking in the International Boxing Federation’s (IBF) Heavyweight ratings. Many observers, this one included felt that Cunningham won the fight based on his ability to outwork Glazkov over the course of the fight and his overall effectiveness. Now exactly five months removed from that fight Cunningham prepares to take on Tarver. Although Antonio Tarver is undefeated in three previous fights as a Heavyweight, an argument can and perhaps should be made that Cunningham is the fighter who has a theoretical edge in this fight due to his having fought several top Heavyweight contenders. Cunningham, who will enter the fight rated sixth in the world by the IBF, has also been the more active of the two fighters as well. The story of this fight in the eyes of this observer will center on which fighter will be able to dictate the pace of the combat. Both fighters have the ability to out box their opponents and both also have the ability to get an opponent out of there should the opportunity present itself. It is logical to assume that this will be a tactical battle that could end up in a very close decision. It may boil down to who can dictate the pace and whether or not that fighter can maintain that pace for the full twelve rounds. Both fighters have been involved in close fights over the years and it would not surprise me to see another closely fought contest where there could likely be a difference of opinion as to who won the fight. 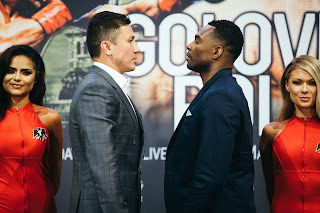 The bout, which will headline the latest Premier Boxing Champions card broadcast by Spike TV in the United States could present some interesting possibilities for the winner. One such possibility could be a potential fight with WBO Cruiserweight world champion Marco Huck, who coincidentally will be making his United States debut on this card in a title defense against undefeated mandatory challenger Krzysztof Glowacki. Huck, who will be attempting to defend his world championship for the fourteenth time (a Cruiserweight record) has competed as a Heavyweight before and assuming the winner of Tarver-Cunningham will be in top contention for a Heavyweight world championship opportunity, Huck, if he is successful in his title defense may view a fight against the winner as an opportunity to potentially position himself to challenge for a world title in the Heavyweight division. An argument can be made however, that this fight between Antonio Tarver and Steve Cunningham is a crossroads fight. For Tarver at age forty-six a loss could put his career in serious jeopardy. The same could also be said in regard to Steve Cunningham, who at thirty-nine years of age could be nearing the end of his career. A loss to Tarver in this fight would likely drop Cunningham from the IBF’s top ten ratings in the Heavyweight division and would likely put the odds of a title shot against either the winner of the upcoming bout between unified world champion Wladimir Klitschko and undefeated contender Tyson Fury or undefeated WBC champion Deontay Wilder in doubt. Two fighters in a theoretical “Must Win” scenario could produce an exciting fight. Who will emerge victorious however, remains to be seen.